Normally, I refrain from advertising products and rather try to teach moderation. However, in this instance I would like to buy a present for our grandparents, but can only do so with YOUR HELP. The famatic picture frame is a kickstarter project that will only be realized if it raises at least 75'000 USD by June 4th. More backers are still needed to materialize the famatic project. The famatic wireless social photo frame is a simple tablet-like device that will let you share photographs with your grandparents or with anybody whom you present with a frame. Instead of sharing photographs via an online gallery, this setup will allow you to display photographs (that you may not want to share online) on frames that you have given to your grandparents, friends, clients or even yourself. Have a look at the short movie below, which introduces the famatic frame and its different functions. I think it is a great idea, seems well made, thoughtfully designed and very easy to use. Quickly head over to the famatic kickstarter project and get your famatic before June 4th! I have already done so and would really like to receive a famatic in October. These three photographs of a blooming poppy field illustrate some of the tips that I shared in the Family holiday photography post from last week. Although I had hoped for the best (I pre-visualized a blooming poppy field in perfect light with a picturesque mountain in the background) I expected the worst (no poppies at all). When we unexpectedly came across these poppies I was prepared enough to realize that this was THE chance and spontaneous enough to adjust (or even use, for example the strong Mistral) the peculiarities of this specific field and moment. Although I could not engage my family in the composition of these photographs (I had to carry the bag and tripod myself) and none of the children wanted to take photographs as well (luckily, otherwise I would have had to wait for the camera), they did not mind waiting and I was satisfied with this short and successful holiday family photography session. 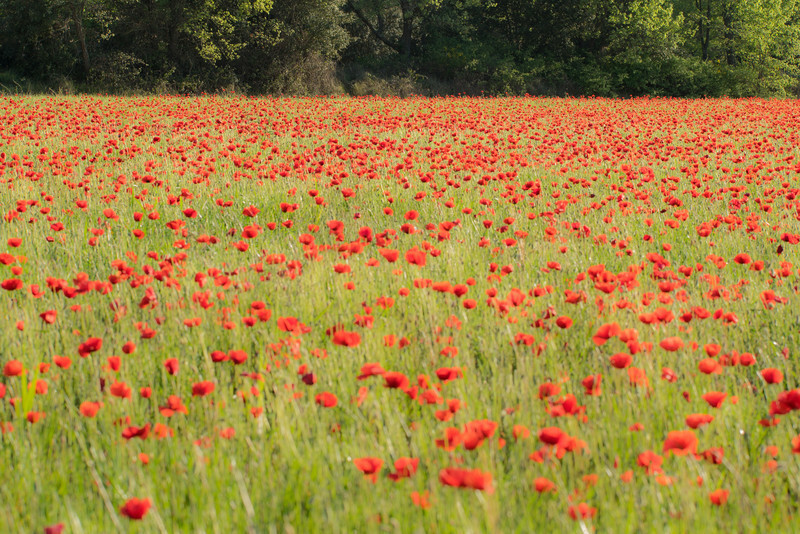 I had seen photographs of poppy fields in the Provence before and tried to find out where such a display of bright poppy-red could be discovered. The village of Rustrel was identified as the poppy field capital and was luckily on our route. 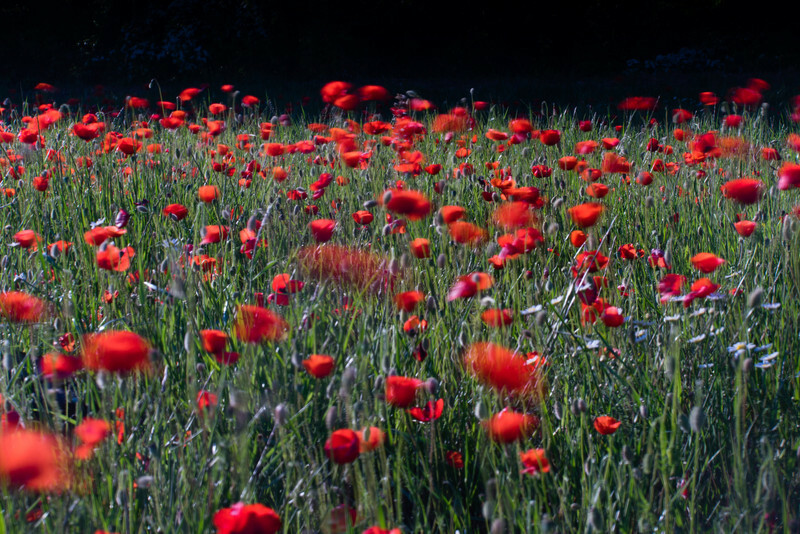 However, the only red that we observed were occasional poppy flowers on the roadside. 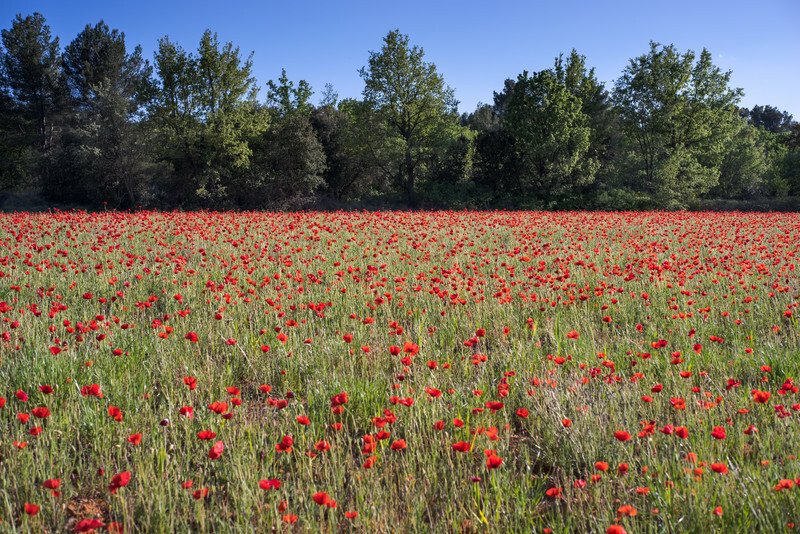 When we had already given up on the poppies, further along the road, after Apt, we suddenly glimpsed a red carpet tucked away in between small patches of forest. It was the only flowering poppy field that we saw during the entire trip (or ever) and I am therefore really happy that we did indeed stop. This short holiday photography session was met with adverse conditions. It was already late, everybody was tired and thirsty, and the children were not in the mood for an extended (and tranquil) interaction with the poppies. Luckily, they could be pacified with an audio book and thus generously agreed to the wait. In addition to the waiting family and my thirst and hunger, a throbbing headache tried to rob my concentration and patience. Therefore I may have composed the photographs more hastily and less carefully than I probably should have. Nevertheless, the short stop was worthwhile and lasting memories are attached to these photographs - exactly because of the sub-optimal conditions that accompanied the moment of their creation. I hope that you can enjoy one or the other of these photographs, even without the personal memories. To seriously photograph while on holiday with my family is often difficult. We get up too late, take too much time getting somewhere, and then I feel uneasy to make my family wait while I photograph. Therefore, my holiday photography is mostly a private documentation of our family adventures, not to be shared here. However, I do manage to steal away some photography sessions here and there to really immerse myself in a subject. This was also how our recent trip to the south of France ended up as a perfect combination of family photography and "my own" photography; I managed to create a few photographs that I am really happy with. The photograph above is one of these compositions. I had envisioned, or rather hoped for, a photograph of moving Greater Flamingos (although in my mental image the water was blue). Since I had a rather clear idea of this photograph beforehand (without really knowing if we were ever getting close enough to any flamingo), I recognized the opportunity when we saw this small flock of wading birds close by. I really like this photograph of moving, foraging and flapping pink birds and the grayish and brownish colors of the water and foreground are even more harmonious than the bright blue in my preconceived mental "photograph". Most importantly, enjoy the time with your family. You only have a few years to enjoy holidays together. Prepare for the best (photography-wise), but expect the worst (in my humble experience an incredibly useful motto in any kind of life situation). Minimize your equipment and carry rain coats, picnic and water for your family instead. Thereby you can go on longer hikes and experience much more memorable adventures with your family. Try to pre-visualize a few possible compositions. This will help you recognize those subjects that you want to spend time photographing with. On the other hand, do not only fixate on pre-visualized ideas and try to react spontaneously to what presents itself (even if you are not out "in the field" at the golden hour). Pursue a theme that is independent of time, weather and location, but that can, for example, be pursued during a rest or picnic (you will likely end up with much more unique holiday photographs). Try to engage your family in your photography. They may help discover interesting subjects or, for example, control the light or shadows for macro photographs. You can also try to entice your children and/or spouse to photograph as well (depending on the size of your family you may end up with no camera for yourself, but with a lot more photographs to sort through on your computer). With a few days of delay comes my April 2014 print. Many years ago (almost 20), I had a poster made of this photograph and I was now interested to see how I manage to print the digitized version of this slide - I am quite happy with the result! 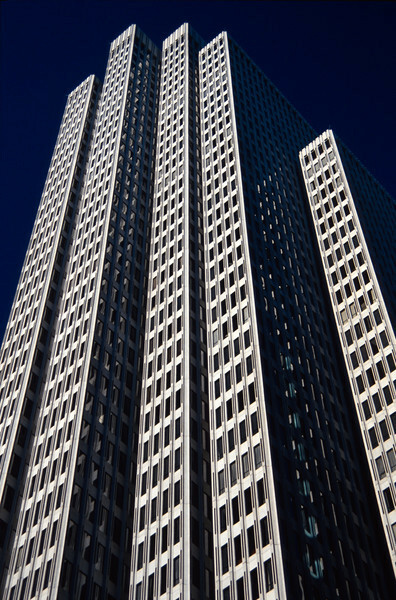 During our visit to San Francisco of last year, I have discovered that the building belongs to the Embarcadero Center (I think it is Four Embarcadero Center). The composition above has already accompanied an earlier blog post - in November 2011. If you would like to obtain a free print of any of my photographs or suggest photograph to be printed in May, please contact me - either via the link on this site or on my homepage. We have been on holiday during the last two weeks and therefore this blog has been somewhat neglected (my monthly print is also overdue). Before I hopefully return to a more regular writing schedule I am showing you here another view of the Forum Chriesbach that I have made and prepared already before our travels. 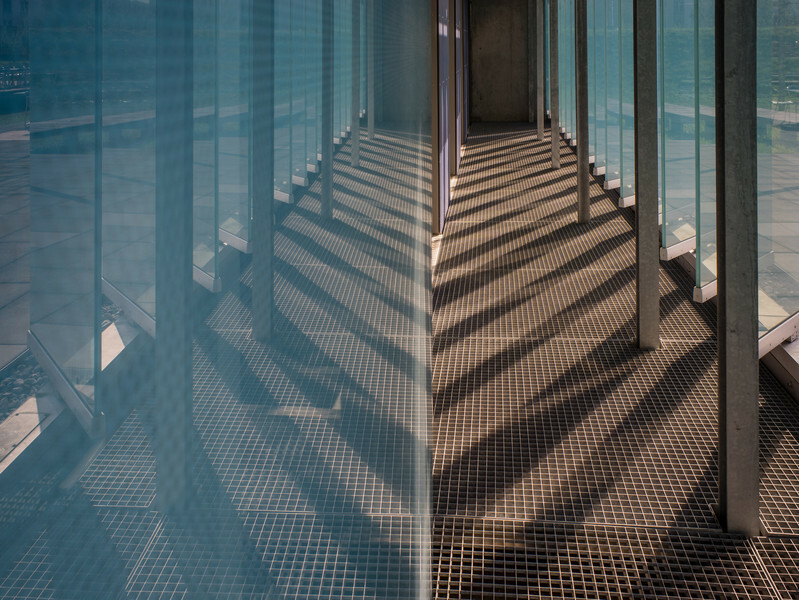 Similar to the last EAWAG nearby photograph, this composition also provides you with a look behind the conspicuous facade of this building and again belongs to the reflection gallery - like the last nearby photograph of the Prime Tower in Zurich. I particularly like the symmetry that such kinds of compositions create.